Hibernated. Seriously. We only went out for about three hours total to meet some friends for dinner. Oh, and I took a picture of my hair (looooooove my new curling wand). Weekends full of movies and pj's and cuddling are the best. Today I get additional pj's since my office decided on mandatory work from home thanks to the polar whatever. Stay warm, people! Curling wands are seriously my new favorite. My hair normally doesn't hold curls unless I literally coat it in hairspray, but with the curling wand it curls really easily and they last all day. I ish hibernated but I get really claustrophobic when I stay in for too long! Yeah me too, I was actually glad to go to work the next day even though it was still really cold. I did nothing spectacular this weekend, either! And the one time I DID go out, I almost died from black ice! Eeee, silly winter. I might hibernate until spring. I totally did the same thing this weekend. I basically binged watched breaking bad for 48 straight hours. oh and I LOVEEEE that phone case! Mandatory work from home? Sounds fantastic! We had a snow day on Friday so I enjoyed the long weekend. But you're right, most of it had to be from inside, this weather is crazy! Yeah for realsies, I'm glad it's calmed down a little! I can't believe you get to work from home because it's cold! Hahaha, that would NEVER happen in Canada, sadly! Loving your hair curly! Gorgeous! Ha, I know right! Chicago basically shut down, almost everyone I know had the day off. I was glad not to have to go anywhere, apparently it was so cold that the track switcher things for the trains stopped working so getting to work would have been a nightmare. Your hair looks great! ♥ :) I've been hibernating too, it's way too cold outside. Ive been debating this curling wand thing, now I'm convinced! Where is it from? Mine is Jose Eber. It's kind of expensive but it seriously works. My hair normally doesn't hold a curl well, with the curling wand the curls stay all day with barely any product. Love the curls! 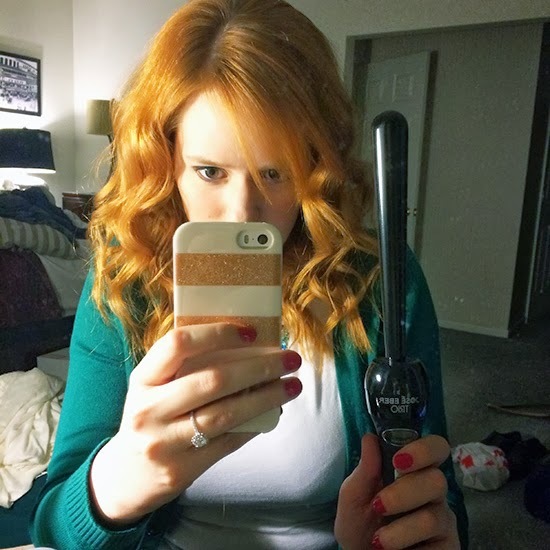 I'm still using a regular curling iron, but have been meaning to try a wand. I spent much of the weekend hibernating as well....which is why I had time to re-design the ol' blog. Nice use of your time! I highly recommend the curling wand, it works wonders! I really want a wand, what brand is your and do you like it? Mine is Jose Eber, kind of expensive but I think definitely worth it. My hair normally doesn't hold a curl well, with the curling wand the curls stay all day with barely any product.